Today we’re releasing Numerics v1.1 with Custom JSON integration and removing the entry barrier to getting started with Numerics by making the app available as a free download. 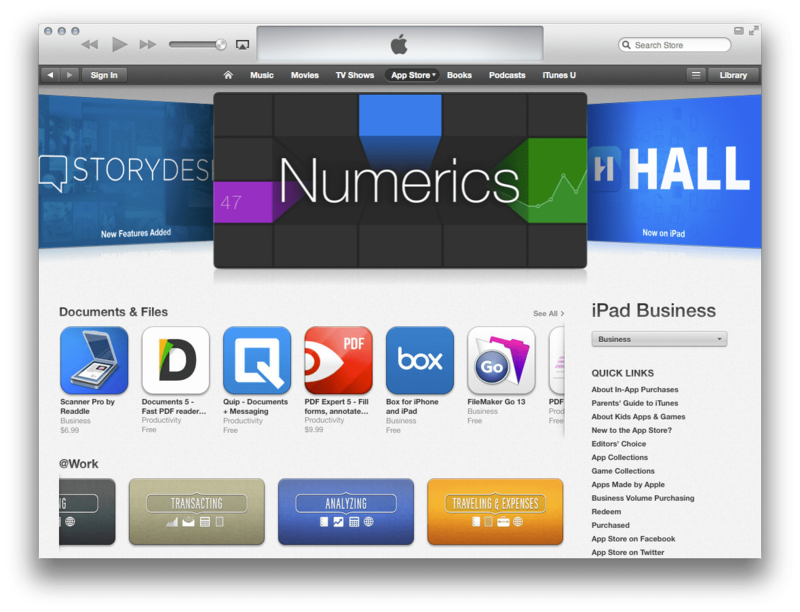 Numerics v1.0 was applauded by the media, our customers loved it and Apple showcased it. Numerics was featured on the App Store homepage in India along with 78 other countries and prominently featured with a banner in the Business Category in the US and in various other lists. Numerics also got some awesome reviews from TUAW, iPad Insight, Springwise, iCulture and more. But the most exciting element has been the ever encouraging feedback shared by our customers. While some of our users depend on Numerics for their daily dose of numbers on their iPhone or iPad, many have deployed it on dedicated big screens in their offices. We’ve received a large amount of feedback and our users are craving for more service integrations. The biggest feature request has been some way of connecting to custom internal business data from systems within the businesses network. We understand that many businesses have their own set of custom business software that run behind their firewall and hold valuable data. So with v1.1 we are adding a Custom JSON integration provider that can consume and render 9 unique types of widgets out of custom data from any business system with minimal programming on the business system end. The business software simply has to output the desired data in a JSON format compliant with the Numerics Widget Data Specification that is well documented within the app. ( Sample JSON data can be obtained here ) This new integration will enable developers and business users to create mobile dashboards using their valuable data that resides in custom business software, alongside the 20+ integrations with popular cloud services. Numerics is designed to give businesses a better way to visualize their vital numbers in one place and make better decisions. We want to enable more users worldwide who depend on cloud services and apps to experience Numerics and take advantage of this powerful tool. We released 1.0 as a paid app with a relatively high entry cost of $19.99 (or equivalent) but with all integrations and features available to all customers. This allowed us to build a small but very valuable set of early adopters who have been actively seeking for a solution like Numerics to create business dashboards and are glad to buy, use and provide valuable feedback about Numerics. It also helped to ‘kickstart’ a positive revenue stream for the app to fuel continuous development. We think Numerics is now ready for the whole world to use. This version onwards, we are removing the price barrier and making Numerics available for free for the world to use. Users can now download Numerics and connect with the many free widgets from 20+ services. To track additional metrics, Numerics offers various premium widgets that are available for purchase in packs as one time restorable purchases and unlimited use. Premium in-app widget packs are priced depending upon the service and kind of widgets in the pack. Unlike other business dashboards available on the market, we are not charging any monthly or annual subscription fees! To thank all our early adopters and backers who supported us by buying v1.0 and providing their invaluable feedback, with v1.1 we have something really special for them. All our customers who have purchased the first version of Numerics will automatically be upgraded to an exclusive lifetime Numerics unlimited access for free. This means that all current and future in-app purchase driven premium widgets and services will automatically be unlocked for use for free forever. All these users will also see a special icon next to the version number in the preferences screen to indicate that the app identifies them as special! We hope that you like our token of appreciation and hope that you recommend Numerics to your friends and colleagues, now that it is much easier to get started with. Numerics 1.1 contains various bug fixes and optimizations stemming from user feedback as well as fixes for iOS8. A complete list of What’s New in v1.1 is available on the App Store. If you have been waiting to try out Numerics, now is the best time to try it for free!